We cordially invite you to our new pension, located close to the border crossing Běloves-Kudowa Zdroj. The picturesque town of Náchod with its rich and cultural history is only a 10 min. walk or a 5 minute ride away by public transportation. 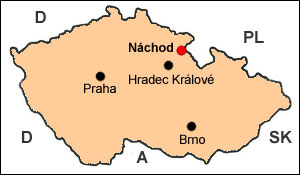 Náchod, in the valley of the river Metuje in the Náchod highlands on the northern slope of the Orlické Mountains is not only an important cultural and economic centre, but also a notable tourist path crossing. The Náchod castle carries the building marks of its renaissance and baroque owners to this day. The shopping centre is 300 metres away. The pension is surrounded by woods and the river. 10 min drive – Rozkoš dam and reservoir, possibility of swimming and fishing. It is possible to visit well-known castles in the close surroundings – Náchod, Ratibořice, Kuks, Opočno, Nové Město n. Metují. You can also drive up to the Teplice-Adršpach Rocks. It is also worthwhile to see the strongholds from World War II. You can combine trips into the beautiful countryside with cycling. Jirásek cottage at Dobrošov (623 m. above sea level) 7 km from Náchod. Žaltman (738 m. above sea level) – a metal construction tower in the Jestřebí mountains, free access all year round. Ruprechtický Špičák (880 m. above sea level) – a metal construction tower in Javoří Mountains 8 km from Meziměstí, free access all year round. Water reservoir Rozkoš near Česká Skalice – yachting, windsurfing, boat rentals, fishing, bathing. Úpa river – appropriate for kayaks and tourist boats, recommended passage is from Úpice to the Rozkoš dam. Ranches in the surrounding area, riding schools with the possibility of riding instruction. Náchod and area – Renaissance castle, art gallery, Jirásek cottage with the look-out tower on top of Dobrošov (622 m. above sea level), garrison stronghold from the year 1938 (artillery stronghold Dobrošov, infantry blockhouse N-S82 „Březinka“, NS-47 „Jaroslav“, Kudowa Zdroj, Bledne Skaty, Szszeliniec Wielki in Poland. Adršpach – Adršpach Rocks – „Křížový Vrch“ (Cross Peak), the border crossing Zdoňov on the tourist trail to Poland. Broumov and area – the Benedikt cloister, wooden cemetery church from the year 1495, the Baroque chapel „Hvězda“ (star) in the Broumov rock face reservation, the group of baroque churches by the Diensthofer architects, Javoří Mountains – the border edge with the Polish Republic. Červený Kostelec and area – the house of B. Němcová, the look-out tower on Žaltman hill in Jestřebí Mountains, recreational lakes „Brodský“ and „Špinka“, the ruins of Vizmburk castle, the beauty-spot „Boušín“. Česká Skalice and area – the museum of B. Němcová, „Barunčina Škola“ (Barunka´s school), Babiččino údolí (Grandmother´s valley), Ratibořice castle, the military cemetery and relics from the war of 1866, the ruins of Rýzmburk castle, auto camping and the dam and reservoir at Rozkoš. Hronov and area – the birth house of Alois Jirásek, the mineral wells in the town park, the Maternice-Skalákova spring, Turov - mythical hill, Kudowa Zdroj – a Polish spa resort. Jaroměř and area – the gothic cathedral of Saint Nicholas, underground corridors of the Josefov stronghold, the railway museum, the Velichovky spa, the baroque castle „Kuks“. Meziměstí and area – the look-out tower on top of „Ruprechtice Špičák“ (Dog-tooth hill) (800 m. above sea-level), Sokolov, Kamenné hory (Stone Mountains), Gtuszyca, Chetmsk, Krzeszow, Watbrzych in Poland. Nové Město nad Metují and area – the tower „Zázvorka“ with look-out, the renaissance-baroque castle, tourist attraction in „Peklo“, Slavoňov with the wooden church from the year 1553, the pilgrimage spot „Rokole“, the former spa „Rezek“. Police nad Metují and area – the table mountain „Ostaš“, the look-out on top of „Bor“ mountain, Machov, Kartów, Radków in Poland. Teplice nad Metují and area – the rock town of Teplice with the rock castles „Strmen“ and „Bischofstein“, the „Vlčí rokle“ (the wolve´s gulch), the rock hill „Čáp“ (stork).